These brownies are very rich and dense, definitely more fudge-like than cake-like. The addition of a half cup of Kahlua makes them an adult treat but you can replace the Kahlua with coffee if you prefer a non-alcoholic version. While the majority of the alcohol evaporates during baking, it's hard to determine exactly how much will be left when they are done. So while these won't make you tipsy, I'm not sure it's a good idea to give them to your kids. Like most brownies, these can be mixed up in only a matter of minutes, bake them in a jellyroll pan with at least 1" high sides or another baking dish. I went with a Bailey's Irish Cream icing because I think the Baileys and Kahlua go so well together, but you could use more Kahlua or just make a simple powdered sugar glaze. Brownies will keep for a couple of days in an airtight container at room temperature. Preheat oven to 350 degrees. Spray pan with baking spray. Set a heatproof bowl over a small pan of simmering water to form a double boiler, add chocolate and butter to bowl and heat, stirring frequently until melted and smooth. Watch the chocolate carefully, you should remove from the heat just before all the chocolate is melted and continue stirring to melt the final chocolate pieces to avoid scorching the chocolate. Set aside to cool five to ten minutes. In a large bowl, mix sugar, eggs and Kahlua on medium speed until well combined. Add chocolate mixture and beat until well mixed. Add flour, baking powder and salt and mix until just incorporated. Pour batter into prepared pan and bake 35-45 minutes until top cracks slightly and toothpick inserted in the center comes out mostly clean. The baking time will depend on how thick your brownies are due to pan selection. Whisk cream and Bailey's into powdered sugar until smooth. If icing is too thick add a little more liquid, if mixture is too thin, add a little more sugar. 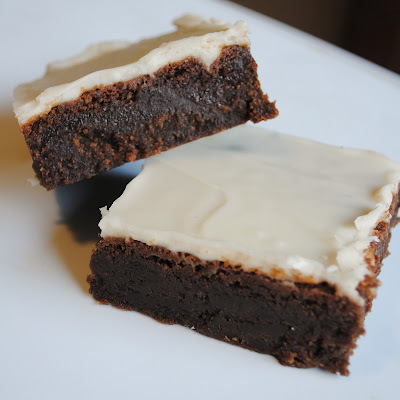 Smooth onto cooled brownies with a spatula and allow icing to set before cutting and serving. 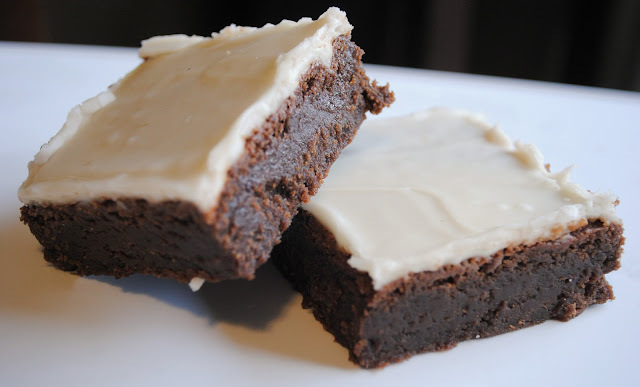 You can chill the brownies in the refrigerator to speed up this process if desired. I will be trying these soon! My friend's birthday is coming up, and she loves Baileys and Kahlua. Great combo! Oh. My. Goodness. These look heavenly! Can't wait to try it for our next grown-up get together! Yummy! Your recipes haven't failed me yet... can't wait to have an excuse to make these. Had to make these today, but of course, no Kahlua or baileys in the house. Subbed brewed vanilla coffee in the brownies and Peppermint Mocha creamer in the icing. Cant wait for dinner to be over so we can dig in! @Beckie - sounds great -- hope they turned out for you! Just in time for Potluck Season! Thanks! These look so dangerous, I have to go and make them right now!